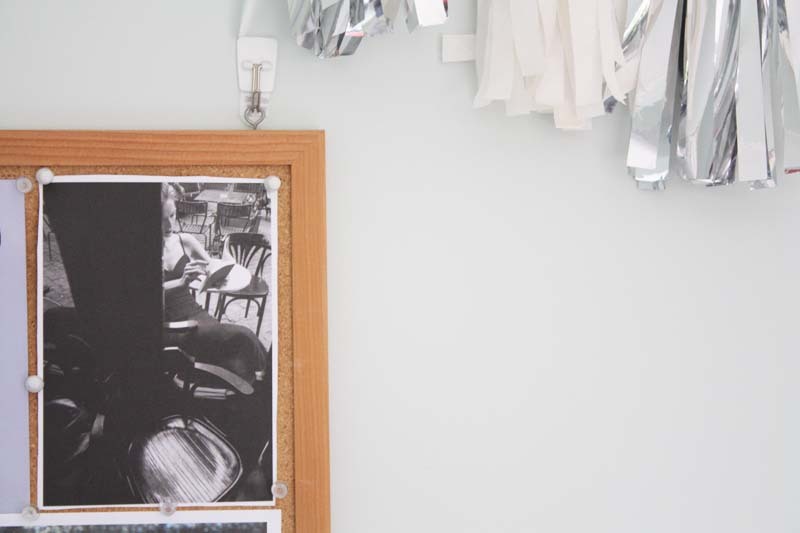 How does one neatly confine a year in the life to a single idea? 2018 for me definitely cannot be wholly categorised by one thought, feeling or phrase. Even though I have been bandying about the notions that 2018 "hurt like a hangover" and I'm hella ready to say "thank u next" to it at midnight. Though knowing me, I'll probably be asleep by then ha. 2018's been a real mix of a year. At its core, it was a year of persistence. It also showed me with somewhat more clarity what it is I truly want, in life both in the present moment and in future. It bought some of the best moments and people in to my life, as well as some painful, truly testing times. 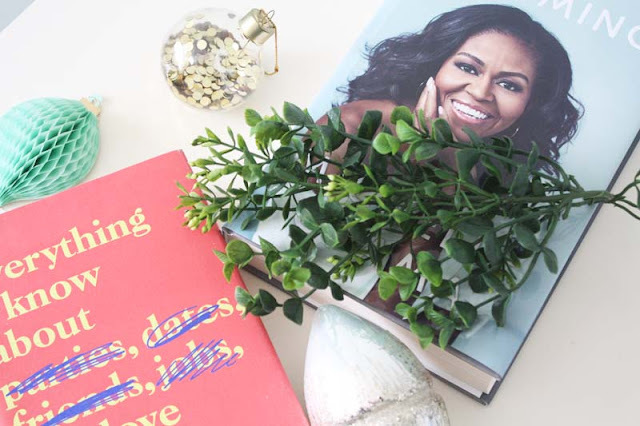 While the year may not have fit into a breezy little Instagram rectangle of good vibes and positivity-it was my life no less and I can look back and learn from it; mistakes, losses, successes, stories and conversations. I can cast my mind back to the moments which make me all misty eyed and smiley as I write this and feel thankful. As is tradition around here, I've compiled some of the good bits of '18 into a little list. An eighteen pointer because I do love me some intentional symbolism. * Melbourne. My week of rest and relaxation. I love solo travel so much and this holiday came at the perfect time-between finishing one job and starting the next. It was a week of doing whatever I wanted, wandering the streets in the early morning with coffee, meals+laughter with friends, literature, theatre and a lot of walking and getting lost in my surrounds. * Entered a writing competition. Whilst I didn't get anywhere with this, I still felt an enormous sense of self-pride just for submitting something. Previous years I'd chickened out. I have one of my personal cheerleaders to thank for the encouragement+support in this area. Without them, I don't think I would have been as committed to entering and putting a story together. * Joined IRL book clubs! 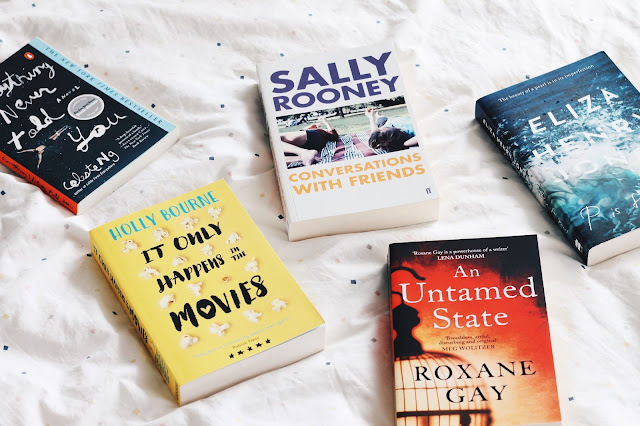 'Poppy Loves Book Club' and 'Lit Reads' at Time Out here in Auckland. Sure I kinda pick and choose which month I go along based on the books, semi defeating the purpose of a book club but the ones I do attend, I usually really enjoy. Some books I read because of these clubs: The Power, My Year of Rest and Relaxation, The Guernsey Literary and Potato Peel Pie Society, Ponti and How To Be Both. * Went to my very first stand up gig at the ripe old age of 25. To see Urzila Carlson and it was such a brilliant night. I laughed until I cried and it was a welcome distraction from some not-so-lovely life stuff that was going on at that time. * I read, a lot. I dipped in and out of books. I immersed myself in single volumes, abandoning everything else. I wrote notes in the margins and underlined passages. I read Sylvia Plath's journals overlooking the ocean and listening to Lana Del Rey. I threw books that perplexed me to the point of frustration across the room. * I housesat a bit and looked after pets at the same time and it was grand. No really. I really enjoy housesitting because it feels like a mini staycation. * Did a magazine swap with Liv. It was fabulous and 'm not gonna lie, it was so exciting getting all those magazines she chose for me in the mail. Stay tuned for round two in the not too distant future. * Went to a brilliant session with Durga Chew-Bose and Lorde in discussion at the Auckland Writers Festival. So inspiring and wonderful. Read my notes here. * All the carpool karaoke sessions. They were plentiful I'm not gonna lie. Lana Del Rey was often on high rotation, as was Florence+The Machine. See also Queen and Mamma Mia 2. Good times. * Sitting in the sunroom at one of my friend's places-actually just our conversations in general. Yes we jokingly throw shade at one another all the time but we also have the best, meaningful discussions. You know who you are, thank you for all the banter. * Saw a lotta films, new and old. The standouts; Pretty Woman, Bohemian Rhapsody, Lady Bird, Muriel's Wedding, Call Me By Your Name, McQueen, Heathers to name but a few. * Mamma Mia the musical aka the one where I was MOVED. Frick I love musical theatre so much. I saw this twice when I went to Melbourne and it was incredible. * Morning meanderings through parks with coffee in hand and music in my ears. Yes please. * Being pushed well and truly out of my comfort zone. I kinda feel like I'm beginning to get this whole 'fake it 'til you make it' in utterly terrifying situations business. Good things I think/hope! * Journaled daily for most of the year. Okay this really derailed around September but I put in a pretty dedicated effort up to that point. Keeping a diary helped me immensely. It's so cathartic and a real focused insight in to your own thoughts. I am determined to get back on track with this in 2019. * Attended some DIY classes: jewelry making, dumplings and mosaics. * On the DIY note,I made an advent calendar this year for a friend of mine and I had so much fun doing it. Check it out here. * Set new goals. Right now I have some creative ambitions I want to start seriously working towards next year. I think for a long time I was lost with what I wanted to do but in the last month or so I've reached some clarity in this sense. Being vague on purpose here. Anyway, it feels exciting. Just as a disclaimer I really have no idea what I am doing but wanting to achieve these things, that I am 100% sure of. -Happy 2019 everyone! If you made it to the end of this accidental essay, congratulations. You deserve a medal. Or leftover Christmas chocolate, the good kind not the ones nobody wants, ahem Picnic bars...Anyway-be good and I will see you all in the New Year. 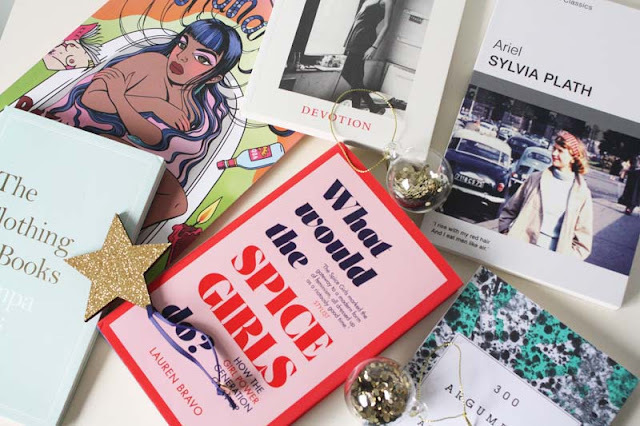 So it's a lil' late but for any of you ultra-ultra last minute shoppers out there, or perhaps someone looking for ways to spend their incoming book tokens-here is part two of my gift guide for y'all. There's something for everyone in this fantastic four...#seewhatididthere. 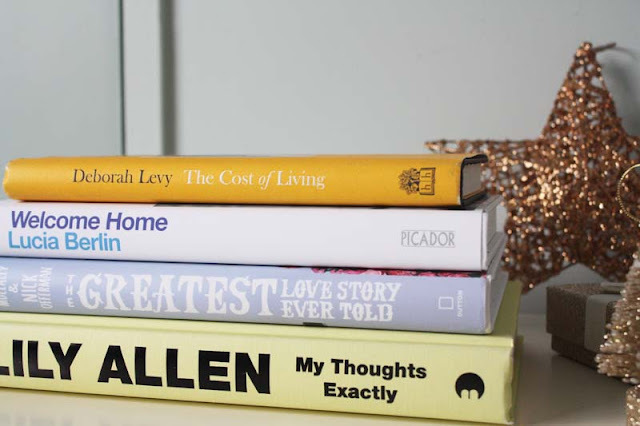 the cost of living x deborah levy: I thoroughly enjoyed this book earlier in the year and I remember losing myself in its pages on many a train trip to and from work. A copy actually made its way to my cousin for her birthday a couple of months back and she loved it as well. Levy writes so candidly and brilliantly on life and loss+the pieces we pick up as we renavigate life and get on with it. She also writes beautifully on friendships of all forms and backgrounds. Definitely one to gift to your friends. 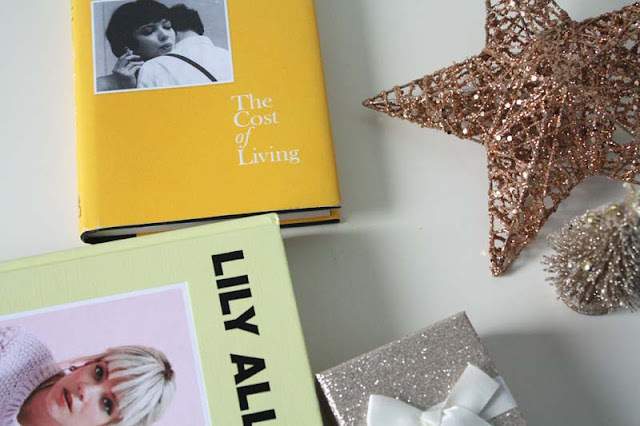 my thoughts exactly x lily allen: A candid, refreshing and poignant memoir by Lily Allen. I devoured this book over a weekend which was already dominated by a rather precarious stack of reads-all swiftly abandoned. Lily writes on motherhood, fame, the music industry, fractured family life and does it all in her trademark honest way. I was expecting to love this book, being a longtime Lily Allen fan. I even had a poster to promote her second album on my bedroom door-a win from Twitter way back in the day. Anyway, loved it-I think even people who aren't necessarily fans/followers of Lily's music would glean something from her insights. the greatest love story ever told x megan mullally and nick offerman: You know how some people stan over Hollywood couples? This is me with Megan and Nick. You cannot not love them. They're adorable together and such talented performers and IT IS KAREN WALKER AND RON FRICKIN SWANSON ok?! Anyway, this book basically reads like a long-form, intimate interview with Megan and Nick. It is funny-oh so funny and heartwarming and I loved it. One for the comedy fans but also the perfect lil' pick-me-up for someone who may need it. 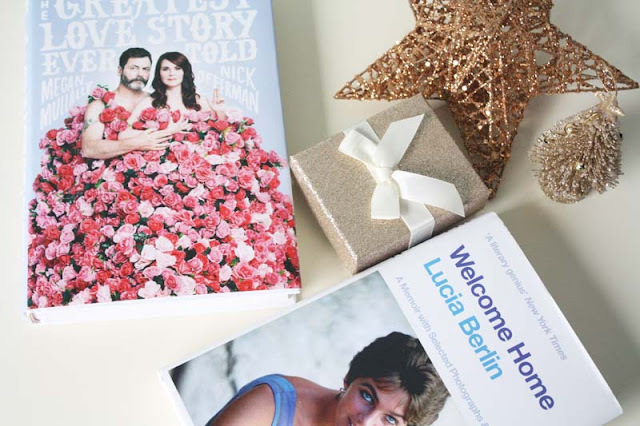 welcome home x lucia berlin: So I've probably done things a little backward by reading Berlin's memoirs first before delving into her short story collections but oh well. Published posthumously, Berlin's writings on her life and experiences growing up. The book is also interspersed with letters to her friends which I really loved reading. The ways in which she particularly writes about place and scenery are so evocative and thought-provoking. It feels very cinematic without being overexaggerated if that makes any sense. Anyway, read. Enjoy. 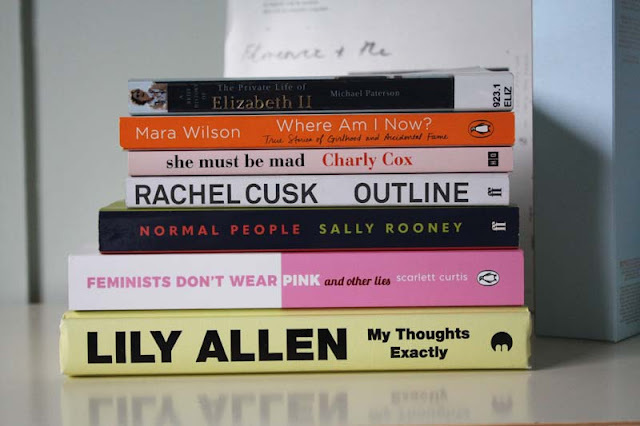 Somehow we are in December and it's time for the final Women & Their Books post for 2018. Today we have the lovely Vita aka exlibrisvita on Instagram. She is currently studying English Literature at Victoria University (the dream) and also contributes to Undone Journal. When she's not studying, she reads-a lot! Her answers below will be testament to that. *Technically, I've been reading a handful of books all year because I'm very good at starting books and forgetting about them! But, the one that I'm really actively reading right now is Ali Smith's collection Public Library which I am really loving. 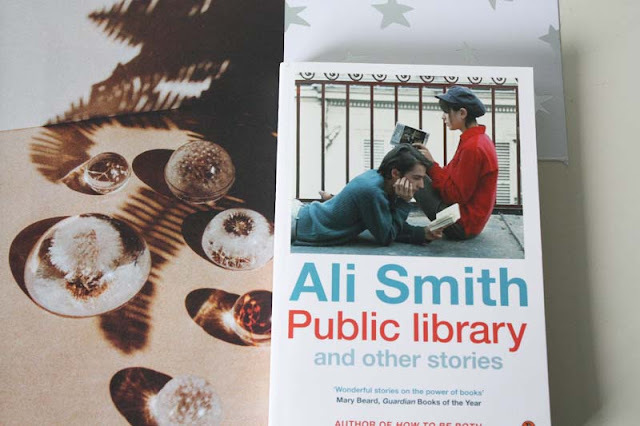 My first Smith and I cannot wait to read more of her work. you've studied children's literature. is there a book you've found through it that you wish you'd read as a child? *I honestly loved Watership Down by Richard Adams, and I think it would have been a great one to have been read by my Mum or Grandma. It's not as blood and guts as people hype it up to be! I also think I would've really enjoyed A Stitch In Time by Penelope Lively, back when I was obsessed with history and reading as much historical fiction as possible. 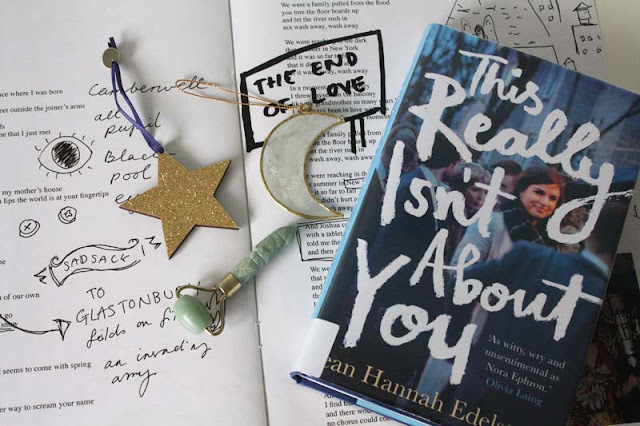 It's a really lovely coming of age story that I think would resonate with a lot of imaginative young girls. 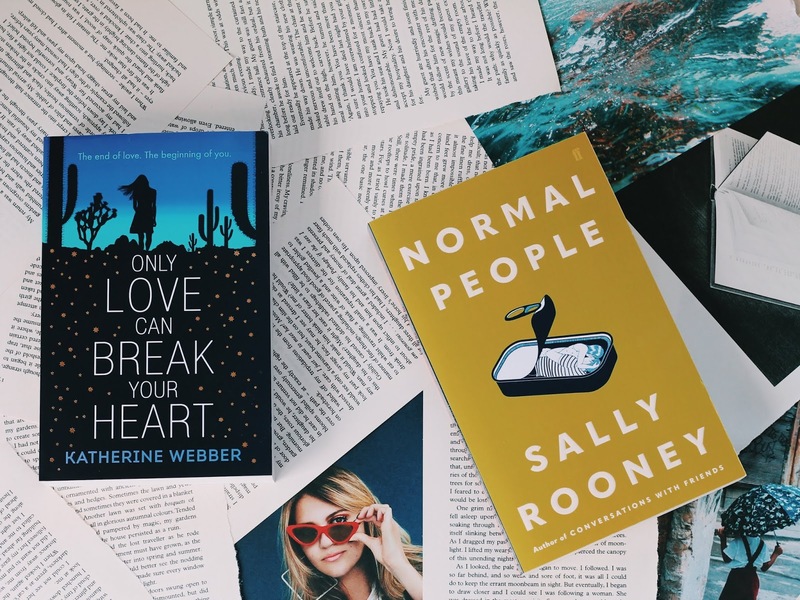 seeing as it's nearly the end of 2018, what has been your favourite book of the year and why? *How to Write an Autobiographical Novel by Alexander Chee. I read this just after finishing a course in creative nonfiction at uni and it was the exact right thing to read at that time. I was so inspired by Chee's ability to play with the form and make it whatever he wanted it to be. I'd really recommend it to anyone who loves personal essays-you don't have to know anything about him to enjoy this work. I didn't and I absolutely loved every word! My favourite essay was 'The Rotary' which you can read here. what books are currently on your wishlist? *Commonwealth by Ann Patchett, The Year of Magical Thinking by Joan Didion, Orlando by Virginia Woolf and I'd love to read The Diary of Frida Kahlo at some point soon too. a book you wish would be adapted for film or tv? *This is SO hard. I would usually say the His Dark Materials trilogy by Phillip Pullman. I think that it's already being adapted for TV (we won't talk about that dreadful movie). I've just glanced over at my bookshelf and The Night Circus by Erin Morgenstern jumped ou at me. If they could pull that off I would love it so much. I think it'd be better suited to TV than film though-to be honest, I think most books are. 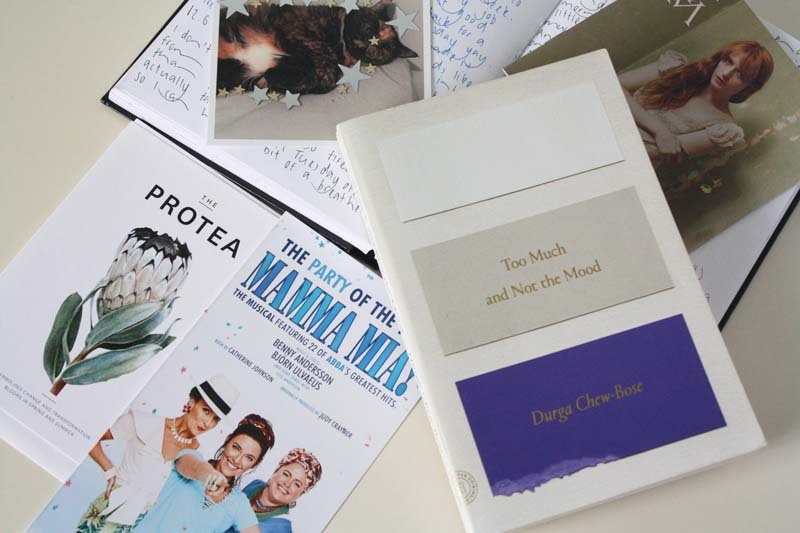 Film often has difficulty pulling off the nuances of books. what's your favourite book or piece of writing by a writer and why? * #1 The Three Loves of Persimmon by Cassandra Golds. This book got me through a really tough patch in high school and I still love the imagery and story so deeply. A coming of age story with a healthy dash of magic and painful honesty about life as a young woman. Who doesn't love a story starring a mouse and a florist? #2 Breakfast at Tiffany's by Truman Capote. I'll be honest, I read this one because I was obsessed with Audrey Hepburn at the time but it's now one of my all time favourites in its own right. I find Capote's use of language so captivating and the nuances of Holly and the narrator are incredible when you consider what a short little novella it is. #3 The Story Girl by LM Montgomery-she ain't just about those Green Gables books. This book just stuck with me. Maybe because the heroine was a badass dreamer who was determined to get famous by telling stories or maybe it was just Montgomery's wonderful way with words. Either way it is a book i'll always cherish and I hope I get to pass it down to my kids one day. 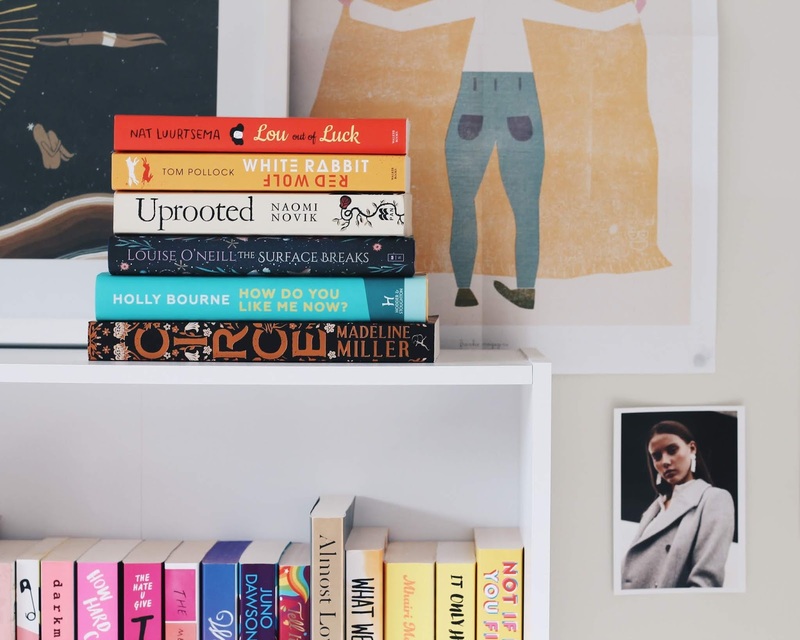 finally, what is one book you think every woman should read? *The first book that came to my head was The Art of Asking by Amanda Palmer. I read this one in high school and it really found me at the perfect time and is a book I think about quite frequently. I think as women we're often expected to be understanding of other people's needs before our own and often get placed in the role of "mothering" others when it's really not appropriate. I'm really lucky to have grown up in a generation where that is changing but there are still aspects of that attitude that are highly present in our society. Palmer's book talks a lot about the power of asking for help when you need it, speaking up and making yourself be seen. She also talks about making an effort to really see other people-to stop and pause and look around ourselves. I know it's talked about a lot, but the intensity of our social media age is really scary sometimes and any book that reminds us to really look at the people around us, and to speak up if we need help, is truly valuable. 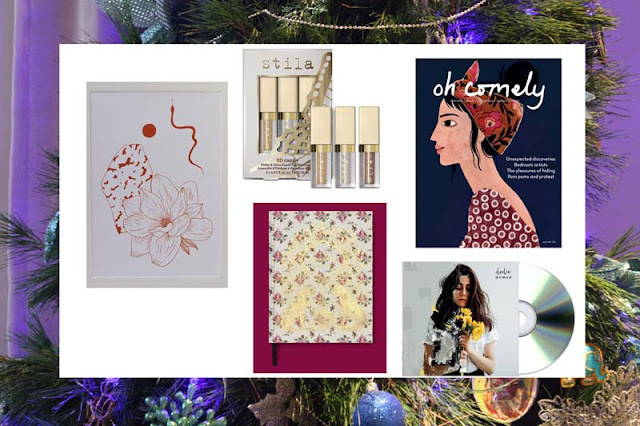 -Thanks to Vita for being December's Women+Their Books interviewee! I'll be bringing this feature back in 2019 so keep an eye out for more interviews then. Becoming* x Michelle Obama: The must-have memoir and a book that has unsurprisingly raced to the top of the in-store bestseller lists since its release. I am going to be devoting some serious time to this book once work wraps up for the year but so far, it is wonderful. I mean, how can you not love Michelle Obama? This is going to be an inspiring and brilliant book, I can tell. 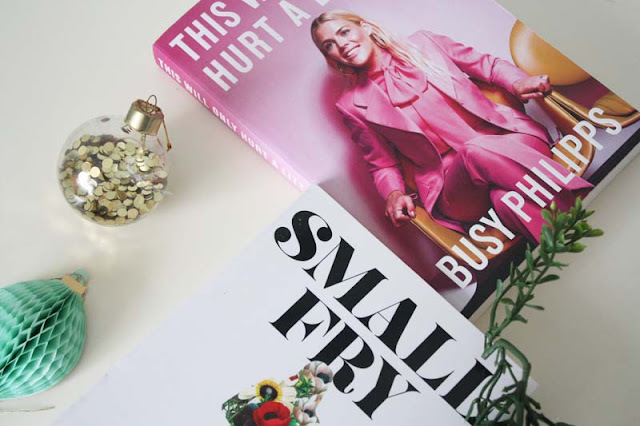 Everything I Know About Love x Dolly Alderton: I do name-drop this book a lot but with good reason. It is undoubtedly one of my favourite reads during 2018. It's moving, brilliant and such a wonderful look at female friendships, women and relationships in every form. Dolly is the Nora Ephron for my generation without a doubt and that is why it is resonating with so many of my friends. I will definitely be revisiting this book and making it an annual re-read for sure. If you are in Auckland, I know this is flying off the shelves at the independent bookstores but you may just find a copy hidden amongst them. 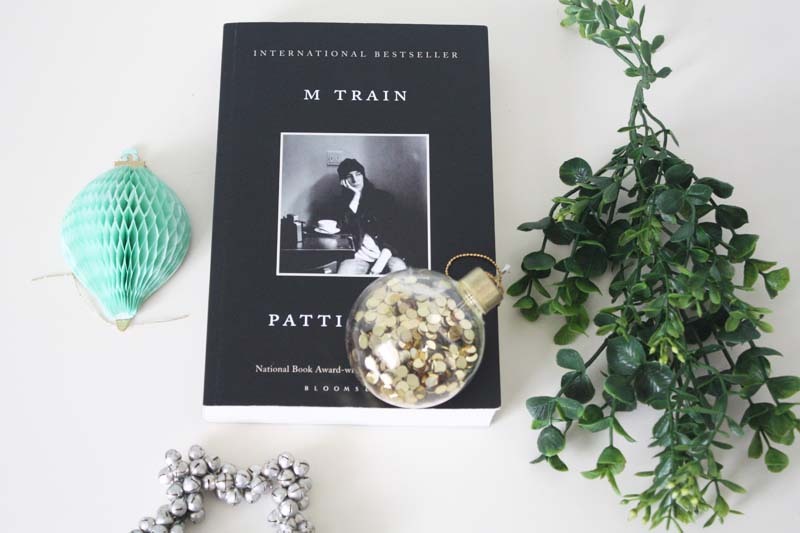 M Train x Patti Smith: I love Patti Smith's writing and I thoroughly loved reading and annotating my way through M Train. This is definitely one for the writers and artists in your life. Though I feel anyone who appreciates books and coffee, two of life's greatest pleasures without a doubt, will also relate to this. It's beautifully written and I highly recommend it. If you're wanting to treat someone as well-this newly released, illustrated edition of her book Just Kids would be well received I am sure. This Will Only Hurt A Little x Busy Philipps: I loved this book and think Busy Philipps is incredible so apologies for the incredibly biased, incoming musings. Naturally her book is candid, hilarious and at times deeply moving. You'll laugh and quite possibly cry reading this book. Her writing is honest but not in a 'tell-all, make sales from all the scandals' kind of way. If anything, it made me appreciate the nature of the beast that is Hollywood. Another one for your girlfriends to read and enjoy this Summer. Actually this'd be the great poolside or beachside read. Small Fry* x Lisa Brennan-Jobs: My friend L borrowed this from me and loved it. I know typically she takes a while to get into books sometimes but this one she raced through. I am yet to read this but have read an excerpt and think it's going to be really fascinating. Admittedly I don't know a lot about Jobs the person, beyond his tech achievements so I am looking forward to getting into it from that perspective too. I feel like this and the Michelle Obama memoir would go hand-in-hand this year for inspiring, fascinating reads. -What books would you recommend for Christmas? Stay tuned for part two soon! 'Tis the season for gifting! Whether that be treating yourself, or the rad people in your life. 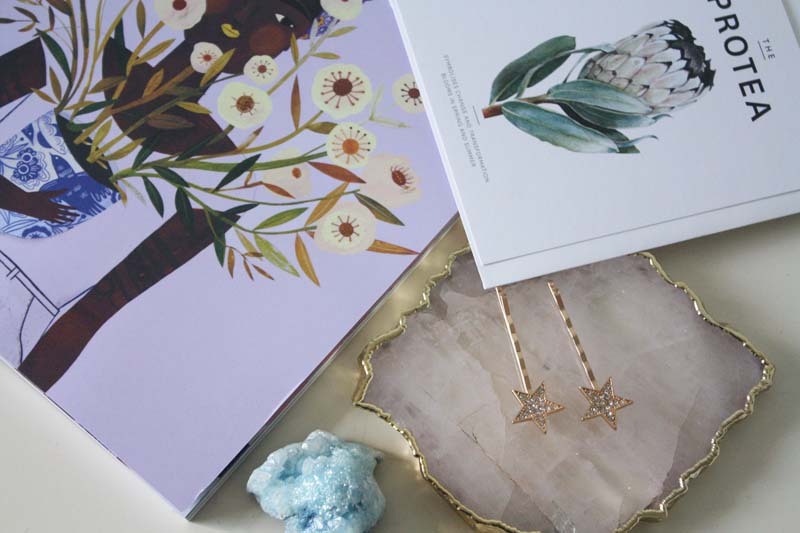 Today we have a little mini gift guide of bits 'n bobs I personally think would be rather neat to receive this Christmas. In fact, I've actually purchased some of the items on this list and through my bookish gift guides, see the first here. 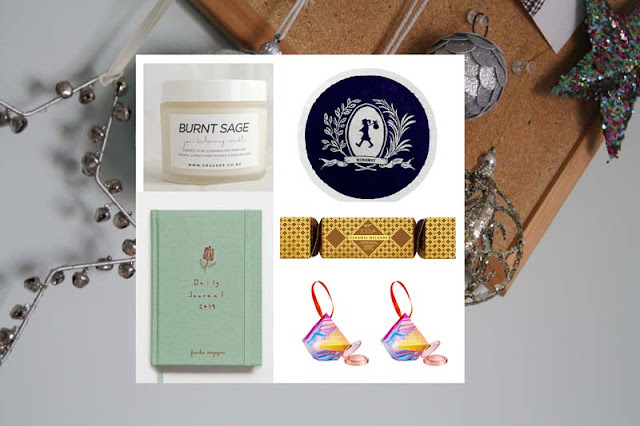 There's beauty, reading material (of course), some homeware bits, stationery (again, of course) and some miscellaneous bits. Enjoy! *Fruition Print x Pigment Studio: As an aside, Albertine is one of my talented pals and I've actually purchased the A5 print of this for myself this Christmas. I love it! *Useless Magic x Florence Welch (Gucci Edition): Isn't this stunning!? The original is exquisite also but this Gucci edition is next-level. How special would this be to unwrap? Ahem. *Oh Comely Magazine, Issue 46: One of my absolute favourite magazines. I've recently bought a subscription because waiting for it in the shops here in NZ was becoming too much of a task. In all seriousness, get yourself/your mates the latest issue with their Christmas presents. Support print everybody. *Burnt Sage Candle x Crushes: My pal Emma gave me this candle for my birthday and it is the best. I love its scent and its ability to fill my space with the most divine fragrance. I highly recommend giving the other Crushes candles a sniff as well. They're exquisite. 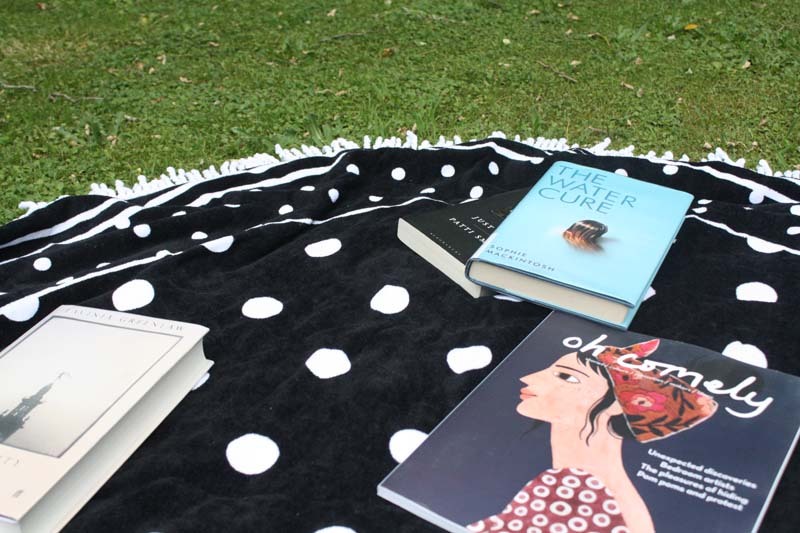 *Runaway Girl Round Towel x Karen Walker: Round towels=the ultimate backyard staple for reading sessions under a tree in the sunshine. Or a picnic. Or just to y'know, sunbathe responsibly. *2019 Diary x frankie magazine: I've purchased this as a gift and it is beautiful. If I hadn't gone and been super organised and bought my Kikki K diary as per usual, this diary would be mine. I LOVE the floral illustrations x Edith Rewa throughout. *End Of The Rainbow Toiletry Bag x Gorman: For some reason I'm kinda obsessed with rainbow-print accessories at the moment and whilst I don't exactly need a new makeup bag, I am being drawn to this. Also, makeup bags are useful af. 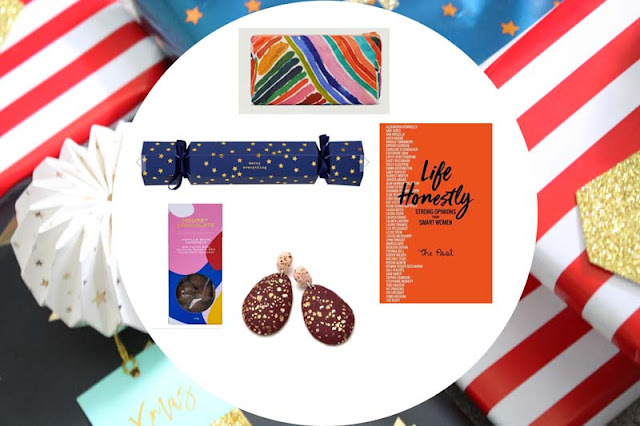 If you want to go the extra mile-fill it with some of your favourite products for the recipient to enjoy. 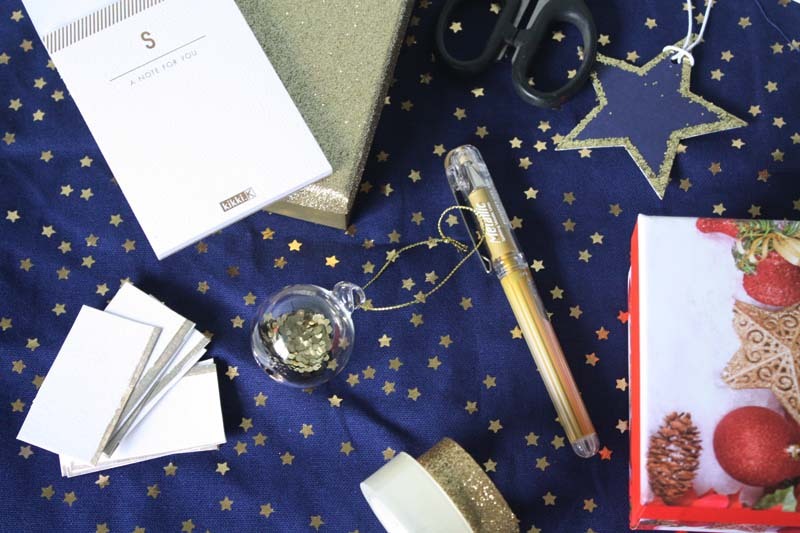 *Trio of Navy Pens x Kikki K: If you saw my Advent Calendar post, one of these pens ended up included as a gift. 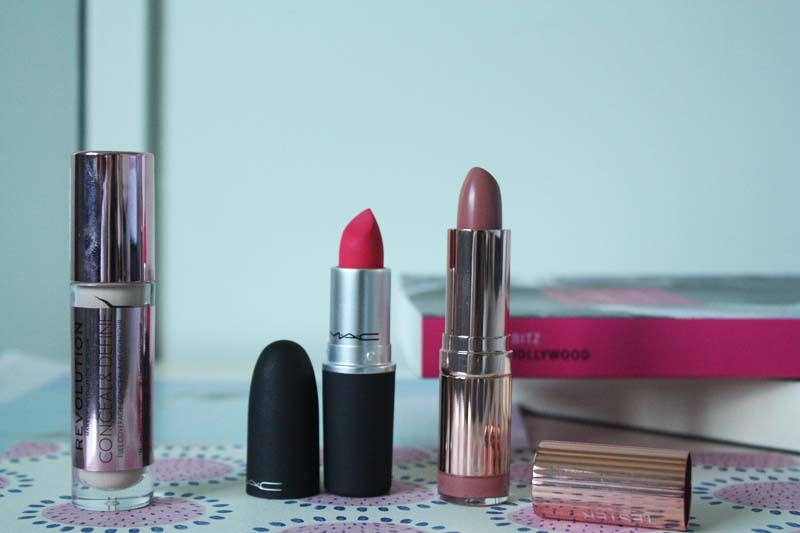 Trios like this and the Stila set are great for dividing up amongst people. -What are you gifting this Christmas? 'Tis the season and whilst I am a 20-something, I still get excited by the prospect of chocolate advent calendars. And just advent calendars in general really. So when I found out one of my friends had never had an advent calendar before it set off a lightbulb in my brain. One; because I'd been considering what to gift her for Christmas for weeks and two; because it just seemed so genius and obvious that it was going to be this. 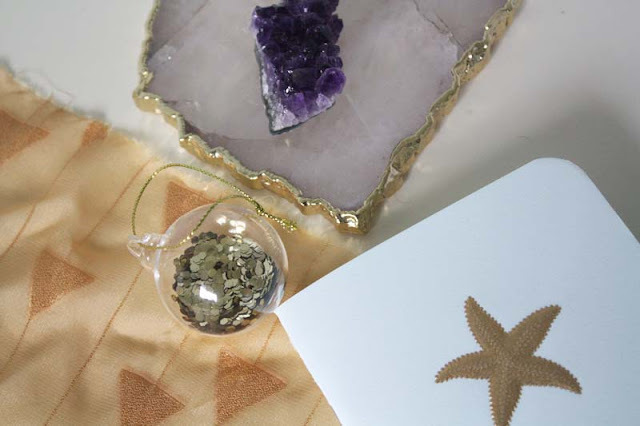 I have to give full props to Tara and Ellen from shopstyleconquer for the inspiration here. These ladies have made one another DIY advent calendars over on their YouTube channel for the past few years and it definitely made me want to join in on the fun. I have instructed my calendar recipient to stay off my blog for the month, so if you recipient, yes...you are here, get off my blog now! You have been told. Everyone else, here's how I did it. I don't want to call this a full-frontal DIY because honestly it was pretty easy to compile and I cheated a bit design-wise. So if you're after the next level things, go to Tara and Ellen's channel. 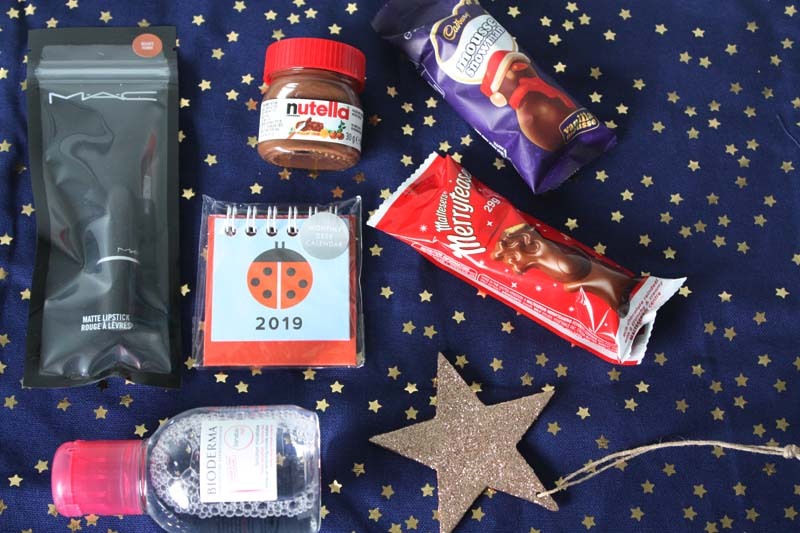 What You Will Need: *Presents/Items (more on this below), *a handy drawstring bag, *tape, *scissors, *notepaper (if you are like me and want to leave little notes to accompany gifts), *wrapping paper, *gold gel pen, *card for your number labels. / I made my calendar for two weeks. The idea being that the recipient can open it closer in the lead up to Christmas but also because let's be real, these things can get expensive. She also had the option to open it every alternate day but again, each to their own. / I purchased this drawstring bag from Kikki K when they had one of their member sales. I think these are also designed to be like 'Santa Sacks' to leave out for presents. Did anyone else have those back in the day? Or the OG pillowcases? Sorry, showing my age... Anyway, I know this kind of detracts from the visual advent calendar aesthetic. It's not a box with windows but I saw this and the gold and navy stars and thought it was beautiful. Plus, it can be reused rather than thrown out/abandoned like cardboard more than likely would be. / The notepaper is not an essential but because I like writing and also wanted to provide some notes so my friend knew why I'd included certain things, I just thought it was a fun touch. Initially I was going to make like Ellen and include some compliments/little notes for her but I actually over-allocated days. Next year perhaps! / Again, another lil' thing I borrowed from Ellen was the idea of cards labelled with handwritten numbers. Initially I was going to use stickers here but I couldn't find any that met my admittedly fussy standard. Plus I wanted to go for the handmade look more. This card with the gold painted edge is actually repurposed. I received these as part of a baking themed present and there were a lot of them so I measured them up for the days and then cut around them to use as the labels. / As well as wrapping paper, I also used some decorative boxes I found at a $2 shop. I went to a few $2 shops for decorative ideas and if I do this again I will utilise them more. I particularly love the gold glitter box I've included, it's actually for Day 14 of the calendar as I wanted it to stand out. The gifts: As this was my first year making one of these things I tried to achieve a few things gift-wise. I wanted to include; things my friend could use for a bit of a pamper, some of my favourite beauty products, a book I had on my shelf to read so that we can buddy-read it, stationery and some Christmas decorations. So without being too specific, though these images are spoiler-y enough-friend, please click away right now if you are here, here's some examples of what I included. Beauty: A favourite lipstick of mine (shoutout to you Velvet Teddy, she's already opened this day so I can get away with it), micellar water (bit of an in-joke as well as being useful), face masks and my favourite mascara of 2018 (this one which I purchased discounted from Chemist Warehouse). Stationery: I think it's a given with any gift I give; stationery will most likely be a part of it. I included some of my favourite pens (I need to get someone else on the Muji bandwagon) and also this teeny-tiny calendar because I just thought it was cute and would brighten up her work desk a tad. You will also see a notebook though that forms the crux of the calendar so I can't say much on it. Sorry! 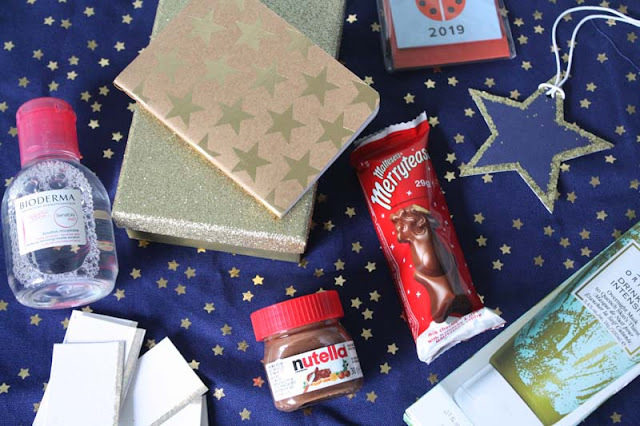 Miscellaneous: Chocolate, standard advent calendar inclusion really. I opted for Malteser Reindeer and also the Cadbury Mousse Snowman. Two of my favourites, plus I thought they were a bit more exciting than the standard wrapped chocolates you can buy any old time during the year. I also included a mini jar of Nutella. Side note; how cute are these!? Decorations: The glittery star you see is from Stella and Gemma and the glittery bauble was part of a set I already had from H&M Home. So that's the gist of the advent calendar in a nutshell. If you've ever considered making one, do it. They are so fun to put together and wrap up and the rest. I honestly had the best time working on this. I hope you're all having a lovely start to December so far! 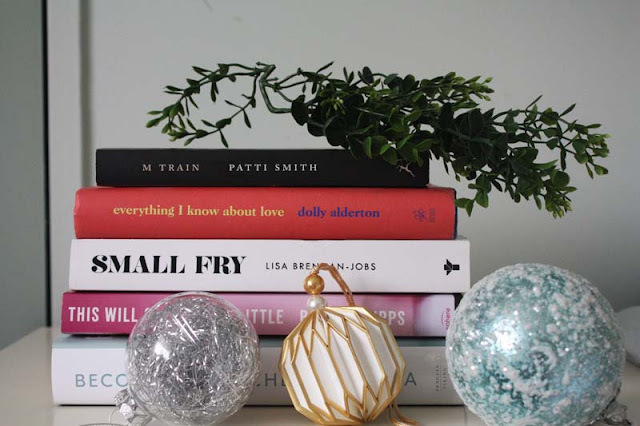 I will be back soon with another bookish gift guide for y'all so stay tuned. Why hello, Happy Tuesday and happy (almost) end of the year. So crazy to be typing that, yet alone thinking it. 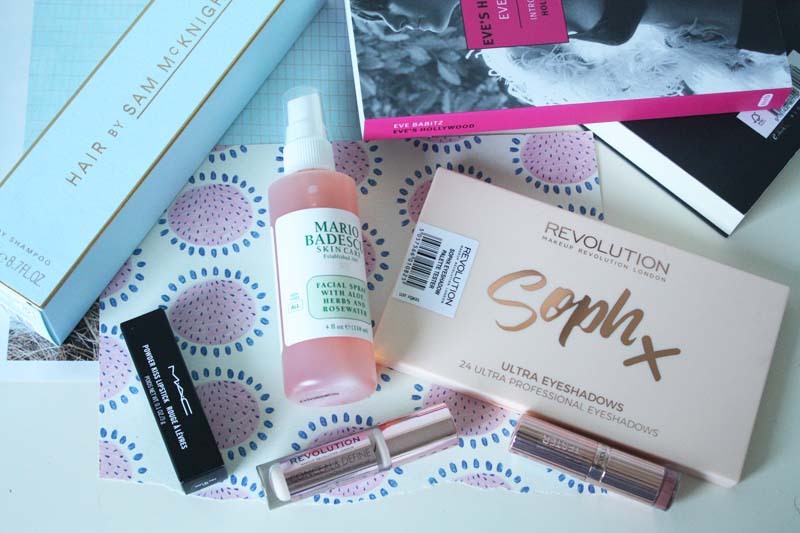 Today we have November's favourites. On the beauty side things there's a few tried and tested loves, plus of course some music and literature in the mix as well. Patti Smith prose: Meditations on life, art, music, literature, artists and the smaller things. All so beautifully compiled and woven together like a tapestry by Patti Smith. Earlier in the month I read and underlined M Train to pieces and I am now doing the same with Just Kids, though the latter is a reread. I lovelovelove Patti's writing immensely. She's currently working on a new book too. Can I get an amen? Coco Mademoiselle Intense: Honestly, I'm too much of a fragrance flitter to really declare one scent a signature but Coco Mademoiselle x Chanel has been my ride-or-die for a while now. Yes it's luxe but it lasts an age. My original bottle from three Christmases ago is still going strong. And now I have this lil' lovely. Well actually I've had it for most of the year but seemed to have neglected to sing its praises. Think of Mademoiselle Intense as a stronger version of the original. It packs more of a punch but not in an overpowering way. If anything it lingers a lot longer on the skin which is fine by me. If you're a fan of the original but want something with a bit more oomph, I highly recommend this. MAC Tan Pigment: This. Pigment. Though. I am so glad I finally caved and treated myself to this earlier in the year. I'd literally been lusting after it for years and it's easily one of my favourite beauty products of 2018. It's a soft, rose-gold pigment with a slight metallic but sparkly finish. You can use it wet or dry, I apply it wet to amp up the colour more. It pairs so beautifully with shimmers but also more sepia and bronze-y toned shadows. I love using it to layer as it really adds another level to eyeshadow looks and always looks stunning. MAC Pigments are one of those products you'll have for years and because you need hardly any per application, they last a lifetime. 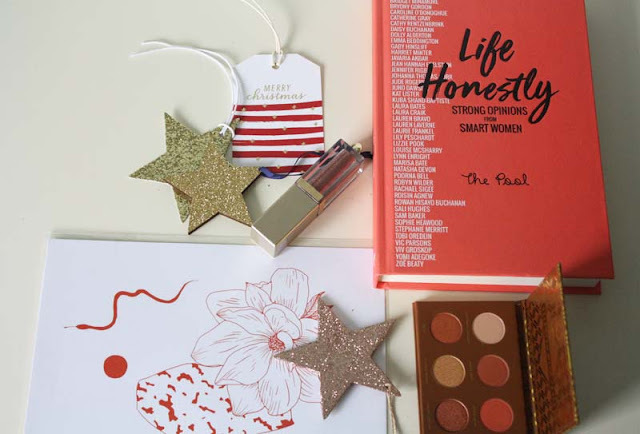 If you're looking for a cute Secret Santa gift for a makeup-lover, I highly rate this. 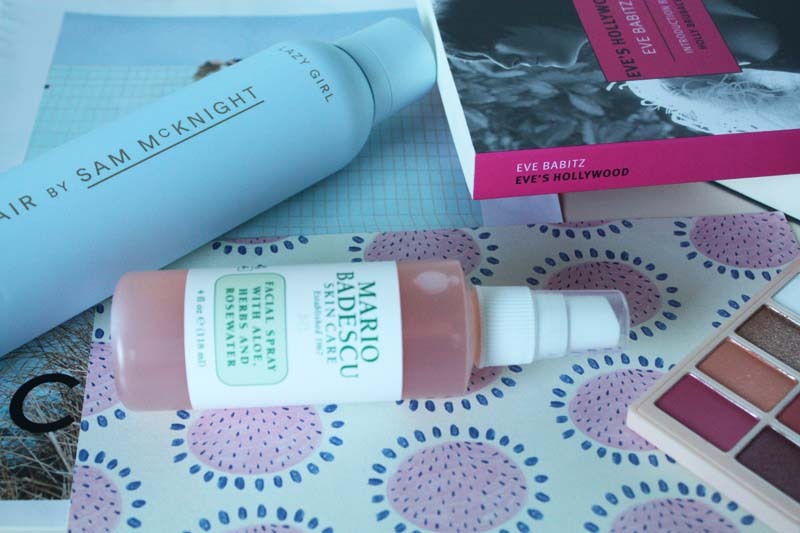 Bioderma: Over the years I've tried many a micellar water but none of them compare to the cult classic. In my opinion at least. Now we can finally get it in New Zealand too, from Chemist Warehouse. Again, can I get an amen? I've even bought a bottle of this for my friend's advent calendar to get her hooked as well. It doesn't have that tacky feel, no scent and just removes makeup like nobody's business. It's a bit more expensive than the micellars lining the supermarkets but I honestly think it's worth every cent. Queen: Ever since seeing Bohemian Rhapsody, twice, Queen has been on high rotation on my playlists. I actually have the greatest hits compilation in my car right now. I'm terrible at reviewing music but I love it and it brings back nostalgic memories of driving to school. It seemed to be in the family car stereo for a while there and I just remember thinking their music was so clever and brilliant. I still think it's brilliant. I mean Bohemian Rhapsody is an anthem, don't @ me. -What did you love during November?